Motivation Research is grounded in the means-end theory of decision-making, used by some of the best marketers and communicators in the world for more than 50 years to build powerful and persuasive campaigns. 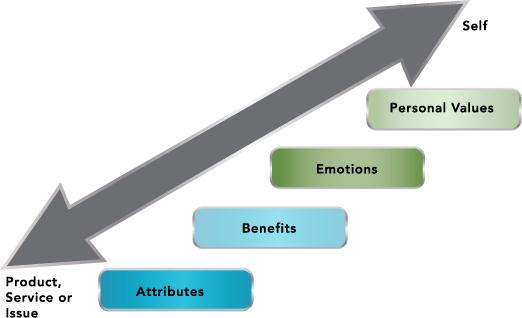 Means-end theory embodies the two key dimensions of persuasion: understanding the target audience’s personal values and understanding the emotional links that tie those values to a specific decision. Well grounded in academic research and marketing literature, the means-end theory asserts that people make choices about a product, service or issue in a manner that taps into four dimensions: attributes, benefits, emotions and personal values. Motivations are based on both rational and emotional elements and driven by personal relevance. A decision becomes more personally relevant when people perceive that the decision will help them realize their values. Artemis Strategy Group’s Motivation Research approach enables clients to achieve effective persuasive communication by tying a “rational-emotional” connection to a particular decision or call to action.